6” Terra Cotta Pot (4.5”h) 5 Ranunculus bulbs, sm'ART foam® - flowers, birds & letters, lollipop sticks, scotch tape, soil & water. Place a piece of scotch tape over the drainage hole to prevent soil from coming out while working. Adhere sm'ART foam® flowers, birds and letters to the outside of the pot. Simply peel off the self-adhesive sticker and press onto pot. Fill pot 2/3 rd full of soil. Add 5 Ranunculus bulbs 2" deep then cover with soil to the top. 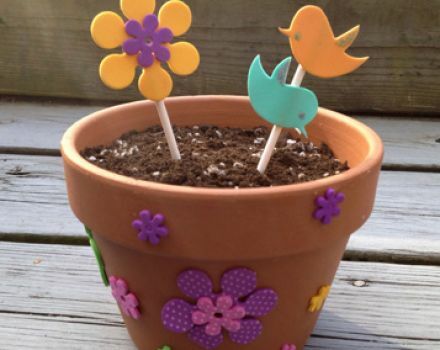 Adhere foam flowers and birds to lollipop sticks and place in soil (optional). Use permanent adhesive glue to avoid damaging pot outdoors. Blooms early to mid summer. Blooms in 8-10 weeks.